We are a leading Exporter of driving gloves beige grain from Kolkata, India. Driving gloves are basically a kind of hand covering been manufactured by soft quality leather with wide work efficiency. High-quality leather has been inaugurated in their production as the useability demand for that. 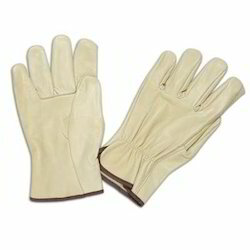 Driving Gloves Beige Grain are designed in a way to hold and grip hard things so it require a high frictional assistance while sometime they need to be temperature resistant.